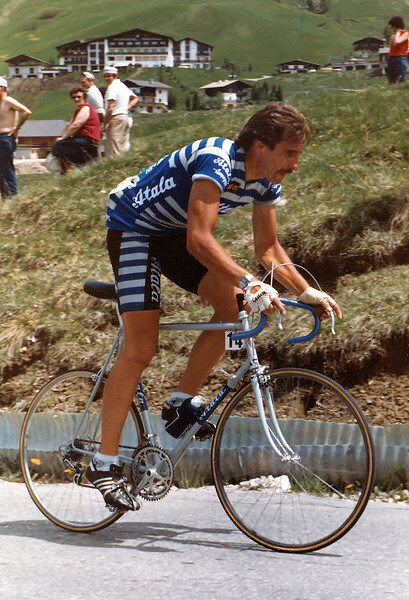 Das Foto zeigt den erfolgreichen Schweizer Rennfahrer Urs Freuler beim GIRO 1983 am Campolongo Pass im legendären Atala Team Trikot. Urs Freuler errang 70 Siege auf der Straße und war 10x Bahnweltmeister in seiner erfolgreichen Karriere. Im November 2018 feierte er seinen 60. Geburtstag. Sehr gefreut hat es mich, während der Mallorca Challenge 2019 seinen Neffen, Jan Freuler, persönlich kennengelernt zu haben. Er fährt 2019 für das Amore&VITA Team und ist auch auf der Bahn erfolgreich. The Tour de France, which ended with the victory by Geraint Thomas, celebrated the 40th anniversary of the first of five victories by Bernard Hinault. But the first Grand Tour won by the French champion was the 33rd edition of La Vuelta in the spring of 1978. Since then, no winner has won the Tour and La Vuelta in the same season until that was accomplished by Chris Froome last year! History remembers that, according to the race plan drawn up by Cyrille Guimard, his mentor, Bernard Hinault wisely waited until he turned 24 to participate in his first Grand Tour, without going through any apprenticeship phase. Asked to search through his memories, he recalls that “In anticipation of the Tour de France, we did La Vuelta in April to see if I could endure the 21-day race. And I proved that it wasn’t a problem.” It was raining in Gijón on April 25th, 1978, the day of the prologue (8.6 km) that the Breton won with a huge number 31 on his back, ahead of Belgian Ferdi Van den Haute who would relieve him of the yellow jersey three days later. “I was especially worried about the Spanish climbers who were coming from several stage races, which was not our case,” he said. If the 1978 Tour de France was famous for the cyclists‘ strike to protest the half-stages, walking across the finish line instead of sprinting in Valence d’Agen, Hinault, the ringleader of the protest, understood that in León, the riders could further their cause against the authorities. 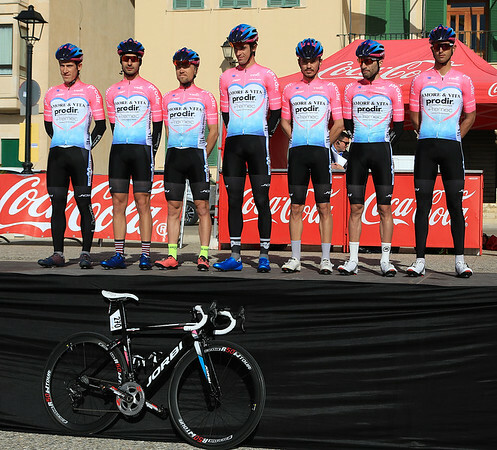 Under the leadership of Txomin Perurena, the peloton threatened not to return unless the five riders who were disqualified for having drafted behind the chaser cars were reinstated. The Spanish climbers concerned Hinault, but the echelons made life difficult for them and condemned Enrique Cima while the Belgians had a field day. Back then, they were never as devoted as after having received their piece of the cake by winning a stage. That’s how the Renault-Gitane team came out ahead in Ávila and Calafell, with Willy Teirlinck prior to the second time trial in Barcelona, in which the distance, barely half that of the prologue (3.8 km) did not allow Hinault to create major gaps. “I knew nothing about the passes the following day” he said. In 1978, La Vuelta had 99 starters and was held in the northern quarter of the country. Returning from Catalonia to the Basque Country with the yellow jersey claimed once and for all in Santa Margarita de Montbuy (stage 12 of 19), the Breton was not yet known as “The Badger” in Spain. “Hinault, maestro y puntillero” (Hinault, master and puntillero) was the headline published in the sports newspaper AS. In bullfighting, the puntillero is the one in charge of finishing off the bull. It seemed so simple, cycling as told by Bernard Hinault. Shortly before his death last May 27 in Durango, where the Sunday morning stage was neutralized following incidents, A. Gandarias, who competed in his last Vuelta in 1978 after taking part in several others, finishing 5th in the 1969 Tour de France won by Eddy Merckx, who has this to say about the few minutes he tried to draft behind the young French rider: “I suffered like a dog.” “Incredible!” remembers Van den Haute. “I rode full speed behind him, otherwise he would have finished ten minutes ahead of us.” The results of the time trial in San Sebastián did not count and Hinault came in first in the overall classification, 2’52’’ ahead of Pesarrodona and 3’47’’ ahead of his teammate Jean-René Bernaudeau, who was making his pro debut at 21 years of age and who is the current manager of Direct Energie. In terms of La Vuelta statistics, years ending in 8 are great vintages, with prestigious champions: Bernardo Ruiz (1948), Jean Stablinski (1958), Felice Gimondi (1968), Bernard Hinault (1978), Pedro Delgado (1988), Abraham Olaño (1998) and Alberto Contador (2008). The 2018 edition is therefore eagerly awaited. Far behind riders of the stature of Eddy Merckx, Bernard Hinault and Mark Cavendish, in the history of the Tour de France there have been almost three hundred men who only got a fleeting taste of glory. As the countdown to the start of the race on 7 July continues, letour.fr is retracing the steps of 10 champions who clinched a single stage win. In 2009, Heinrich Haussler, an Aussie riding under a German licence, delivered a performance for the ages in the Vosges to claim a solo win in Alsace. He is good at almost everything… especially at covering up his tracks. Young Heinrich Haussler left his native Australia for Germany, the country of his father, to pursue his dream of becoming a pro cyclist. 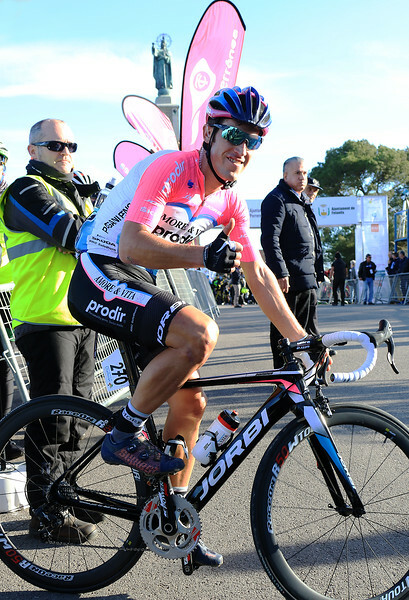 As hoped, he joined the elite peloton at a young age and soon stood out as a promising sprinter: not when he claimed the stage to Alcobendas of the 2005 Vuelta, rather when he finished third in the finale in Madrid, beaten only by Alessandro Petacchi and Erik Zabel. Four years later, Heinrich rocketed to a stage win in Paris–Nice, but the real show of strength came in Milan–San Remo, where Mark Cavendish pipped him on the line, and the Tour of Flanders, where he led the peloton home a minute behind winner Stijn Devolder. At the start of the 2009 Tour, it was clear that the German, now riding for Cervélo after launching his career with Gerolsteiner, was ready to go head-to-head with the fastest men in the world. „Cav“ held the advantage in the first few stages. Heinrich Haussler also had to work for team leader Thor Hushovd, helping him to claim the stage to Barcelona. However, management gave him the green light to attack, which he did in stage 13, a long, hard slog through the Vosges. Haussler joined Christophe Moreau after just three kilometres, with Rubén Pérez, Rigoberto Urán, Juanma Gárate, Jens Voigt and Sylvain Chavanel adding to the numbers another four kilometres down the road. As the peloton came within 45 seconds of the breakaway, he initiated a new selection at km 57. Only Pérez and Chavanel made the cut this time round, with the rest of the group falling back to the peloton. Haussler, still riding under a German licence one year before switching back to Australia, was untouchable on the climbs. The Euskaltel rider got dropped 5 km from the top of the Platzerwasel, 46.5 km before the line, with the Frenchman bonking and losing contact on the descent. Neither the incessant rain that pounded the peloton throughout the five-hour race nor the chill (9 °C on the Route des Crêtes) that put out the favourites‘ fighting spirit blunted the edge Haussler. He was in the form of his life. Heinrich Haussler crossed the line in Colmar with a tearful celebration of what remains his sole stage win so far. The 34-year-old will be racing in the 2018 Tour de France as an all-terrain domestique for Vincenzo Nibali. Far behind riders of the stature of Eddy Merckx, Bernard Hinault and Mark Cavendish, in the history of the Tour de France there have been almost three hundred men who only got a fleeting taste of glory. As the countdown to the start of the race on 7 July continues, letour.fr is retracing the steps of 10 champions who clinched a single stage win. In 1994, the Mont Ventoux was the focal point of the stage to Carpentras, where Eros Poli, one of the worst climbers in the peloton, managed to win after a 171 kilometres alone at the front in a display of sheer Italian class. He looked like a fish out of water, but he was about to land the catch of a lifetime! Eros Poli, the archetypical self-effacing rider, was perfectly comfortable with his role as a domestique. The indefatigable, powerful and devoted Italian was one of the cogs in the machine of Mario Cipollini, a sprinter who never failed to blast away from the opposition as long as his train put him in the right position. Whether it was pulling on long straights to shut down an escape or shepherding and protecting his captain from the wind in the finale, Eros was top of the class. In the mountains, he was also good at setting the right pace in the gruppetto to make sure the worst climbers in the peloton finished inside the time limit. The Giant from Verona was one of these dreadful mountain men. Seeing him in action in the stage from Montpellier to Carpentras seemed as far-fetched as seeing an anvil have a go at the 4×100 metres medley world record. Yet the 1994 was a bag of surprises. It all started when “Cipo” suffered a nasty injury during the last edition of the Vuelta held in April. Without the flamboyant sprinter to rack up win after win in the first week of the Tour, Mercatone Uno had been flailing around like a fish out of water since the start in Lille. Eros decided to roll the dice with solo attacks, for example in the stage to Futuroscope, but was bested by stage hunters from GB-MG Maglificio. It was precisely one of them, Rolf Järmann, who attacked treacherously when most of the peloton had ground to a halt for a “technical stop”. This angered Eros Poli, who caught the insolent Swiss, dropped him and went on a solo adventure with 171 kilometres to go, as if he had forgotten that the Mont Ventoux stood in his way. Far behind riders of the stature of Eddy Merckx, Bernard Hinault and Mark Cavendish, in the history of the Tour de France there have been almost three hundred men who only got a fleeting taste of glory. As the countdown to the start of the race on 7 July continues, letour.fr is retracing the steps of 10 champions who clinched a single stage win. In 1989, a good five years after a 12-day stint in yellow, Vincent Barteau came back with a bang to win the stage to Marseille on the bicentennial of the storming of the Bastille. The Tour de France and Marseille had finally buried the hatchet. It had been 18 years since the peloton last barrelled into the Old Port, arriving well ahead of schedule and prompting a feud with mayor Gaston Deferre. However, the Grande Boucle chose Marcel Pagnol’s city for the stage of 14 July that marked the bicentennial of the French Revolution. At this point in the race (stage 13), the big battle of the year was already in full swing, with Laurent Fignon and Greg LeMond alternating in the yellow jersey and trading blows in time trials and the mountains. The course between Montpellier and Marseille was far from ideal for an ambush, but Fignon blew the peloton apart together with third-placed Charly Mottet in a bid to expand his meagre seven-second lead. Riding alone at the front for more than 40 kilometres, the duo sowed panic in what remained of the peloton and put LeMond and Delgado against the ropes. Their attempt finally came to an end with 26 kilometres to go and, roughly 10 kilometres later, Vincent Barteau followed an acceleration by Jean-Claude Colotti on the Côte de Saint-Antoine. Far behind riders of the stature of Eddy Merckx, Bernard Hinault and Mark Cavendish, in the history of the Tour de France there have been almost three hundred men who only got a fleeting taste of glory. As the countdown to the start of the race on 7 July continues, letour.fr is retracing the steps of 10 champions who clinched a single stage win. In 1974, young Dutch rider Henk Poppe beat the top sprinters to claim the first ever Tour stage run in Britain. He was a true one-hit wonder! It was 1974 and Merckx Mania was in full swing. It was hard to see who could deny Eddy his fifth overall win, especially with Luis Ocaña and Joop Zoetemelk injured and out of the race. The 61st edition of the Tour broke new ground, sending the peloton to British shores for the first time. Plymouth had the honour of hosting this historic stage. The powerful Molteni team had seized the reins of the race, first with Merckx after the prologue in Brest and then with Joseph Bruyère, who had gained time from a breakaway in the following stage. The Cannibal was as voracious as ever after the short boat trip, featuring in all the moves and battling for bonus seconds on the 14 laps of a circuit that included a road bypass. The birth of a star? While Merckx’s rivals for the overall refrained from challenging him during this stage, a fierce battle raged on among the sprinters. Barry Hoban, eager to impress in the first British outing of the Tour, was expected to take the fight to Patrick Sercu. Few people were watching the small Frisol team, a newcomer to the peloton that featured mainly generous Dutch rouleurs such as Fedor den Hertog and Cees Priem, but also a 22-year-old sprinter who flew under the radar despite his big frame: 1.87 m and 81 kg. It was the first Tour de France for Henk Poppe, but he was racing without any inhibitions. The young lad, a product of the Dutch cycling school, was able to go toe-to-toe with the Belgian veterans of a thousand criteriums, kermesses and village races. Merckx opened the final sprint, but it was Poppe who surged to beat Jacques Esclassan and Patrick Sercu. The birth of a star? Sercu handily regained control in the next few stages, with the young talent failing to finish higher than 14th, only to bow out in the Alpine stage to Serre-Chevalier. That was the end of his short Tour career… but that one victory will always be his. Far behind riders of the stature of Eddy Merckx, Bernard Hinault and Mark Cavendish, in the history of the Tour de France there have been almost three hundred men who only got a fleeting taste of glory. As the countdown to the start of the race on 7 July continues, letour.fr is retracing the steps of 10 champions who clinched a single stage win. Back in the 1963 Tour, the Saint-Raphaël team conquered the stage to Roubaix with an Irishman who had put down roots in France. The velodrome gave Seamus Elliott his greatest victory… and a sense of closure. Everyone called him a friend. Seamus Elliott, always wearing a grin on his plump face, spoke fluent French with just a hint of an accent from the Emerald Isle. Even more importantly, he rode his heart out for leaders such as Jean Stablinski and Jacques Anquetil, happy to sweep his own ambitions under the rug without a word of complaint. Although Elliott and his friend „Stab“ had been racing for different teams in the 1962 Worlds, he had done everything he could to slow down the chase in the small group fighting for victory, resulting in the rider from northern France winning gold and the Irishman having to settle for silver. In 1963, the stage from Jambes to Roubaix was well-suited to „Shay“, who had narrowly missed a victory in the Hell of the North due to a broken saddle. The Irishman’s tactics dovetailed with the plans of his leader at Saint-Raphaël. „Maître Jacques“ urged his teammates to control the breakaway, which had good odds of making it to the finish. Stablinski and Elliott —the team’s best assets on this sort of terrain— slipped into the leading group. Elliott was forced to dig deep after suffering two punctures on the cobblestones, the last one just 20 km before the line. Fortunately for the Irishman, the world champion shepherded him back to the escape group on both occasions. Once again, smart tactics and powerful feelings all pointed towards the need to work together in such a tricky finish, particularly with Stablinski seeing an opportunity to return the favour. Stablinski was godfather to Elliott’s young son. The Irishman took a leaf out of little Pascal’s book to hang on alone at the front for the final six kilometres before the velodrome. „Shay“ finished 33″ ahead of a small group of chasers led by none other than Stablinski —good enough to pull on the yellow jersey. Antoine Blondin hailed this double whammy, which no other Irish rider had accomplished, in a piece in L’Équipe titled Ça fait Dublin par où ça passe, where he outlined his vision of an international peloton ahead of his time: „He belongs to a migratory species of cyclists who feel at home anywhere as long as there is bread and a saddle. He is a citizen of the roads, and a race number is his passport.“ Decades before Sean Kelly and Stephen Roche pulled off even greater victories in the 1980s, Elliott kept the yellow jersey for four days, until Angers. Once in Paris, the jersey was safely on Anquetil’s shoulders. Mission accomplished. Far behind riders of the stature of Eddy Merckx, Bernard Hinault and Mark Cavendish, in the history of the Tour de France there have been almost three hundred men who only got a fleeting taste of glory. As the countdown to the start of the race on 7 July continues, letour.fr is retracing the steps of 10 champions who clinched a single stage win. Back in the 1956 Tour, Jean-Pierre Schmitz produced one of the most epic rides in the history of Luxembourgish cycling to win a Pyrenean stage that seemed to have fellow Luxembourger Charly Gaul’s name written all over it. Everyone knows that the first non-French rider to win the Tour was a Luxembourger. François Faber opened the account in 1909, followed a couple of decades later by Nicolas Frantz. Fast-forward to 1956 and the two-time winner of the race (1927 and 1928) was serving as the director of a mixed Luxembourgish-British-Portuguese team for what was expected to be Charly Gaul’s triumphal parade in the Tour de France. The favourite had put his country back on the map the previous year by finishing third overall and winning the mountains classification. The Angel of the Mountains could count on the support of a brother-in-arms who was only slightly less talented. Going into his Tour debut, Jean-Pierre Schmitz already had a few impressive performances under his belt, including second place in the 1954 Critérium du Dauphiné and a nice silver medal won at the Worlds in Frascati, Italy in late summer 1955. Although no-one expected it to be necessary, „Jempy“ was more than ready to step up to the plate if his leader and friend ran into trouble. That is precisely what happened as the peloton rolled out of Pau for the second Pyrenean stage. Gaul showed signs of weakness and Nicolas Frantz gave the go-ahead for the rest of the team to attack. The time had come for Schmitz to shine. After catching the breakaway of the day, he kept his powder dry on the ascent to the Col de Aspin, only to attack on the descent, climb the Col de Peyresourde on his own and plunge to the finish in Luchon. This is how Pierre Chany described this monster performance in the next day’s edition of L’Équipe: „The way the ’spare Luxembourger‘ came back on the climbs was absolutely stunning. Just think of it: after trailing the breakaway by eight minutes while still in the peloton with 54 kilometres to, Mr J.-P. crossed the line in Luchon no less than 2′08″ ahead of runner-up Fernand Picot!“ An opportunity to repeat this flash of brilliance never presented itself to Schmitz, who spent most of his career as a luxury domestique to Charly Gaul, particularly in the latter’s victorious Grande Boucle in 1958. Every man at his station! Far behind riders of the stature of Eddy Merckx, Bernard Hinault and Mark Cavendish, in the history of the Tour de France there have been almost three hundred men who only got a fleeting taste of glory. As the countdown to the start of the race on 7 July continues, letour.fr is retracing the steps of 10 champions who clinched a single stage win. Back in the 1947 Tour, Albert Bourlon went solo in the first Pyrenean stage and brought his adventure to a victorious conclusion 253 kilometres later. It was the longest solo ride in the modern history of the race. Albert Bourlon flew under the radar in his Tour debut in 1938, the penultimate edition before the war. Although a strong and hard-working power rider, Bourlon’s lack of tactical flair seemed to condemn him to a lifetime in the shadow of other cyclists. Fresh out of the Renault factories, where he had taken on a leading role among trade unionists at the height of the 1936 strikes, the communist worker flopped in the Tour de France —still, nothing compared to the trials and tribulations he went through during World War II. Following his capture and imprisonment in German stalags, he tried to escape again and again until he finally managed to break out. He crossed Ukraine, Slovakia and Hungary on foot until reaching Romania… where he even managed to win the Bucharest–Ploiești–Bucharest classic in 1944! When it came to daring escapes, the rider from the Berry region earned a reputation for being as tough as nails, and he was even decorated with the Croix de Guerre. However, when the peloton rolled out from Carcassonne in the 1947 Tour de France, no-one seemed concerned about the France Centre/South-West rider when he jumped right after Jacques Goddet gave the start from his Hotchkiss cabriolet. Even Bourlon had his sights set on making a quick buck by taking the bonus available in Espéraza, about 50 kilometres down the road, and certainly not on reaching Luchon all on his own. Bourlon’s solo exploit, virtually unmatchable now that stages tend to have a more reasonable length, is often described as a record, which is true for the post-war era. It is also true that René Pottier rode alone for 325 kilometres to win the stage from Grenoble to Nice in the 1906 Tour. However, that was at a time when the general classification was points-based, so winning by a mile was the same as winning by an inch! Far behind riders of the stature of Eddy Merckx, Bernard Hinault and Mark Cavendish, in the history of the Tour de France there have been almost three hundred men who only got a fleeting taste of glory. As the countdown to the start of the race on 7 July continues, letour.fr is retracing the steps of 10 champions who clinched a single stage win. Spaniard Federico Ezquerra demonstrated his climbing abilities in the 1936 Tour under grievous circumstances. Back home, the uprising of Francoist forces had just pushed the conflict between Republicans and Nationalists past the point of no return. In the history of France, 1936 is remembered as a time of harmony, optimism and social progress, as seen in the Tour de France itself following the introduction of a week of paid leave. Meanwhile, on the other side of the Pyrenees, the electoral victory of a coalition also known as the Popular Front in February sparked a wave of violence that led to the Spanish Civil War several months later, when the Nationalist faction launched a failed coup on 17 and 18 July. Spanish riders had started the Tour de France on the defensive —on the cobbled sectors, for example—, but the start of the mountain stages brought with it their chance to shine. The leg-breaking course of the stage from Nice to Cannes on 19 July whetted the appetite of Federico Ezquerra, possibly the most explosive member of the Spanish Armada. Ezquerra’s climbing abilities had caught the attention of L’Auto, which nicknamed him the Eagle of the Galibier after he was first over the top of this mountain pass in his debut in 1934. On this occasion, the Spaniard dropped his breakaway companions Sylvère Maes and Félicien Vervaecke like a stone on the ascent to La Turbie. However, the two riders were still hot on his heels, and there were 30 kilometres to go before the finish in Cannes. After crowning the ascent, the Basque rider decided not to change gears, which at the time required stopping for half a minute to spin the back wheel. Ezquerra’s gamble paid off and he went on to claim the greatest win of his career on the French Riviera. L’Auto seems to have missed the political significance of his triumph, but Jacques Goddet meticulously analysed and heaped praise on Ezquerra’s style. „Good old Federico is not particularly aesthetic when he gets up on the pedals, hunched towards the front, jumping from one thigh to the other like a metronome. He thrusts from his kidneys, seemingly from the bottom up. The hip seems to pull the pedal upwards instead of pushing against it. This type of movement evokes the feeling of levity that has become the hallmark of climbing talent.“ One year later, in 1937, Republican Spain fielded a team composed mostly of exiles, with Mariano Cañardo and Julián Berrendero also taking their only victories at the Tour de France.